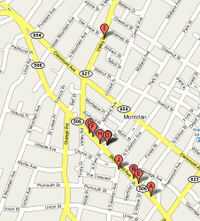 Here are current comments and reviews on some of the Montclair, NJ restaurants we know. Information based on our own visits, discussions with friends and other review sites. Let us know your favorite by entering a comment below. Rates the 400+ wine blogs on the web. We hit 97 in April 2007.
and writing about it makes me want to drink it." The new Prudential Center in Newark New Jersey "The Rock" is a wonder to behold. My son and I attended opening night for the NJ Devils. Although they got trounced by the Ottawa Senators we still had a great time. The Arena has a restaurant, three bars, and many food concessions, Devil Burgers at City Grill, Famiglia Pizza, Primo Sausage, Newark Nut Company and more, even a Sushi Bar. 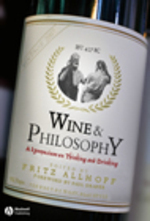 Wine & Philosophy -A Symposium on Thinking and Drinking- is a new book edited by Fritz Allhoff, PHD . Fritz is an assistant professor of philosophy at Western Michigan University and a Research Fellow at the Centre for Applied Philosophy and Public Ethics, Australian National University, Canberra. He has done marvelous work in compiling the words and thoughts of a broad range of writers, presenting many schools of thought. Long Beach Island has been a second home to me for more years than I would like to reveal. While I love just about everything about LBI I have always wished there were more great restaurants and at least one great hotel. My wish has been granted fully by the new Daddy O Hotel and Restaurant in Brant Beach, Long Beach Island, NJ. In Italy you can find great food everywhere. Any little trattoria serves up delicious fresh dishes. But here in the mass produced US that is not the case. Ruthie's is a refreshing return to good fresh food. Their menu is simple but creative, focusing on pizza, BAR-B-Q Sandwiches, Salads, Fries and other accompaniments. Eric Kaplan the chef and owner has put a lot of love into Ruthie's not just in naming his place after his lady friend but also in the interesting and tasty touch he puts on everything he serves. It is a great place for lunch or light dinner, there are a few tables, and take out is of course available. This is another restaurant we have not tried in a while. My son Pierce and his grandfather came back from a day of fishing with a hankering for ribs. Update 10/20/2007: Dined at Indigo Smoke a few weeks ago. It is still great. They have opened a new location in Maplewood, NJ, 1859 Springfield Avenue. Here is one of the best Pinot Gris (Pinot Grigio) I have tasted in some time. Produced by excellent Hungarian winery, Nyakas Cellars. We have raved about their Olivier in previous posts and were delighted to find this wine by Nyakas at Home Liquors in Verona for under $8.00.